There is a story especially in eastern parts of India, which indicates that Ganesha got the head of Airavata, the divine white elephant of Indra, the king of Devas. As per this story, Shiva’s attendant Nandi went in search of a head to fix on Ganesha who was beheaded by Shiva. Nandi roamed around the universe. He went to all the worlds that had the presence of living beings. However, he was not able to get a suitable head for Maa Parvati’s son. Finally, Nandi happened to see Indra's elephant, Airavata, lying down with his head towards north. Nandi attempted to behead Airavata. A fight ensued between the two and soon Indra came to the rescue of his Vahana or mount. Nandi defeated Indra. He then overpowered Airavata and chopped off the head of the white elephant. The head was fixed on Maa Parvati’s son and he became Ganesha. 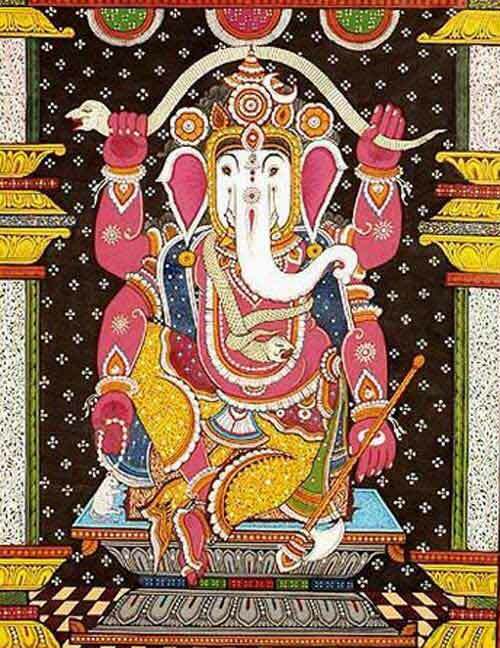 As Ganesha is associated with Airavata, he is also associated with rain, fertility, and prosperity. As Airavata was white in color, Ganesha idol is always white in color in eastern parts of India, especially in Bengal and Orissa.